What’s better than a churro? 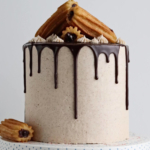 A churro CAKE of course. Especially when it’s topped with my favorite local xurros from 180pdx (if you’re a Portlander or ever come to visit, this spot is a must). 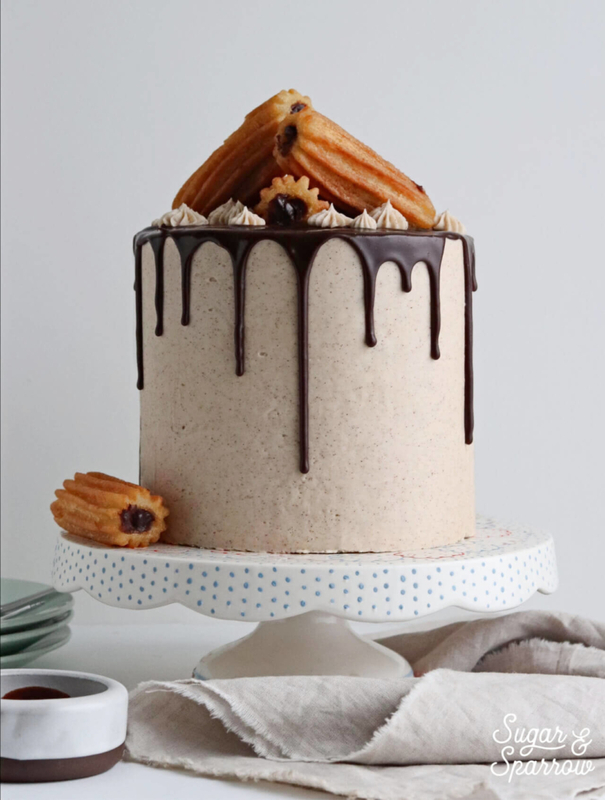 Creating a churro cake has been on my list of ideas for a long time, and I’m so proud to bring you the result of my kitchen experimentation. Behold! No matter what event or time of year, this cake is a true crowd pleaser. Not only is it pretty to look at, it’s bursting with flavor. The cake is cinnamon vanilla as well as the buttercream, and the real kick comes from the Mexican chocolate ganache. It’s spiced with a little cinnamon and cayenne to give your tastebuds a little spice burst after the sweetness of the chocolate. This recipe makes enough for a triple-layer 6 or 8 inch cake. Dress it up with your favorite local churros or homemade churro recipe (I still have yet to try making them from scratch, but when I do I’ll be sure to let you know! ), or get creative with the presentation and let the flavors speak for themselves. However you decide to decorate, I can promise you this: it will be absolutely delicious. I know this because I brought it to work one day and it was gone before lunch – the whole crew at my day job ate it for breakfast! Now that’s a sign of a frickin’ good cake. Preheat oven to 350°F and prepare three 6 or 8-inch cake pans by spraying with baking spray and placing a wax paper circle in the bottom of each pan. Whisk together sifted cake flour, baking powder, baking soda, salt, and cinnamon. Set aside. Cream butter on med-high for one minute. Add sugar and beat on high for 2-3 minutes, until light and fluffy, scraping down bowl and paddle as needed. Turn the mixer down to low and add the eggs one by one. Scrape down the bowl and paddle, then turn the mixer on med-high and beat for about 2 minutes. Add the sour cream and vanilla and continue beating for 1 minute. Add all of the dry ingredients at once with the mixer on low speed until just combined, then add the milk all at once with the mixer still on low. Scrape down the bowl and paddle and mix on low until it all just comes together. You might need to hand whisk at the end to get rid of some lumps, but be careful not to overmix. Fill prepared cake pans ⅔ full and bake for 35-40 minutes or until a toothpick inserted comes out clean. Place chocolate chips in a heat proof bowl and set aside. Whisk together heavy whipping cream, cinnamon, and cayenne in a saucepan over medium-high heat until small bubbles start to form (aka right before it starts boiling). Pour over chocolate chips and let sit for 30 seconds before whisking together until the ganache is uniform in consistency. You’ll need to let this cool on the counter to room temp before filling or dripping the cake. In a large bowl, whisk together powdered sugar and cinnamon. Set aside. Cream butter on med-high until light and fluffy (about 5 minutes), scraping down bowl and paddle a few times in between. Add powdered sugar/cinnamon mixture a few cups at a time, scraping down bowl and paddle between intervals. Mix on medium until fully incorporated. Turn mixer to low and add vanilla and milk. Mix on medium for two minutes. Scrape down bowl and paddle and add salt. Mix for another minute on medium until incorporated. Torte each cake layer to desired height. Pipe a circle of buttercream around the top edge of the first layer (to make a buttercream dam) and fill with half Cinnamon Vanilla Buttercream, half (room temperature) Mexican Chocolate Ganache. Place the next cake layer on top and repeat step one, then add the final cake layer on top. Crumb coat the cake with Cinnamon Vanilla Buttercream, then ice with a final layer of buttercream. Place the cake in the refrigerator for 10-15 minutes to chill the buttercream before dripping with room temperature Mexican Chocolate Ganache. Top with your favorite local churros or topper of your choice. In this design I’ve also piped a few open stars with buttercream using Wilton tip 4B. The cake layers can be made ahead, wrapped and stored at room temperature for up to two days. Alternatively, you can wrap and store them in the freezer for up to 3 months. The ganache can be made ahead and stored in an airtight container in the refrigerator for up to two weeks. To bring back to dripping consistency, heat in the microwave for 15 second intervals, stirring after each interval, until room temperature. The buttercream can be made ahead and stored in an airtight container in the refrigerator for up to two weeks. Bring back to room temperature and re-whip in your stand mixer with a paddle attachment. Add milk, one tsp at a time, if buttercream is too thick. Previous PostWelcome To Sugar & Sparrow!